They’re missing one of their goaltenders, and one of their top forwards. Didn’t keep them from beating the No. 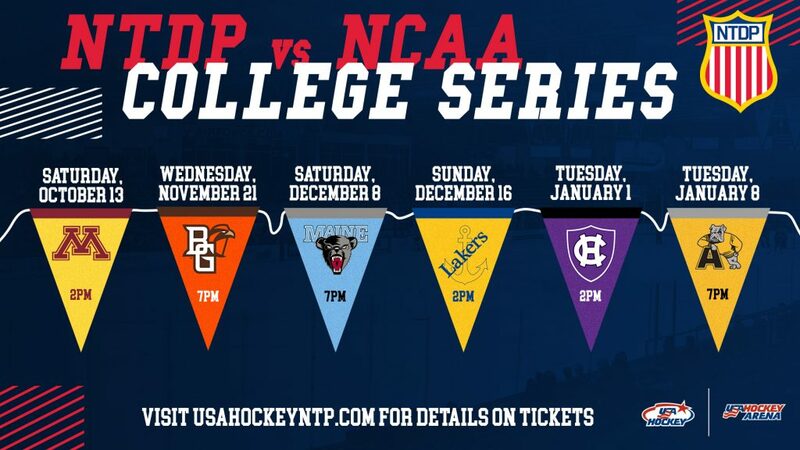 1 team in college hockey on the road. On Thursday night, USA Hockey’s National Team Development Program’s Under-18 Team took on top-ranked St. Cloud State University on the road, and Team USA recorded a 6-4 win. The U.S. squad is currently playing without goaltender Spencer Knight and forward Jack Hughes – both the top-ranked players at their respective positions heading into the 2019 NHL Draft. The two Team USA stars are competing as double under-agers at the 2019 World Juniors in British Columbia. Cole Caufield (Stevens Point, Wisc.) and Michigan commit John Beecher (Elmira, N.Y.) each recorded three points in the victory over St. Cloud Thursday night at the Herb Brooks National Hockey Center. Former and current Michigan resident Alex Turcotte scored the game-winning goal with 45 seconds remaining in regulation. Cam Rowe (Wilmette, Ill.) stopped 25 of the 29 shots sent his way in the victory. The NTDP Under-18 Team is now 20-7-2 on the season; they have recorded road wins against Notre Dame, Michigan, Harvard, Dartmouth and now St. Cloud State in the NCAA portion of their schedule.